Hello and sorry for the delay. I’m on vacation and working on a maddeningly slow dial-up connection which took way too long to configure on the very-tanned Mrs. E’s notebook. Even now I’m dubious that I will be able to get back online using my broadband connection when we return…. Vacations are a great time to learn to cook away from the comforts of your kitchen. So far I have all ten fingers left despite the awful kitchen knives in the rental house. So far. With three of us (my Mom is here with us acting as “Nanny” which apparently involves spoiling our kids rotten) banging around in the kitchen, there is more than ever a need to simplify the preparation of meals. Using fresh ingredients and subjecting them to a minimum of handling is the cournerstone of modern cooking. We don’t have to sauce up slightly spoiled meats the way that folks used to. Being at the beach (Duck, North Carolina in this case) means that I have a ready supply (steady stream?) of fresh seafood and fresh famer’s market vegetables from which to choose. Quick, easy and delicious is the name of the game. So I resorted to an old favorite — Moules Mariniere — mussels in white wine, garlic and parsley. That’s pretty much the recipe. But for those taking notes, here you go. a bunch of parsley, chopped. In a large stock pot, melt the butter and saute the onion until it’s translucent. Add the garlic and most of the parsely. Saute for a minute or two. Add the wine and mussels. Cover and steam over medium heat until they open (about 7 minutes or so?) Discard any that haven’t opened, they won’t. Using a slotted spoon, transfer the mussels to a bowl. Swirl a knob of butter into the liquor at the bottom of the pot and pour the sauce over the mussels. Sprinkle with the remaining parlsey. Serve with french fries or crusty bread to mop up the juices and a green salad. Pass the pepper grinder for those who want it. Here’s an easy and elegant (sort of) tip about pulling mussels from a shell. 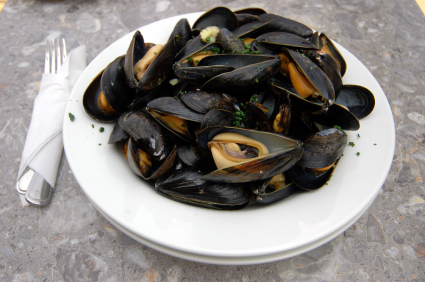 You may, and should i polite company, use a small fork (or an escargot two pronged affair) to eat the mussels. If you’re among friends or out in the country and have neglected to pack flatware, you may use one of the smaller shells like a pair of little tongs to pluck out the mussles and eat them. It’s a little messy, but kind of cool. Last but not least, don’t forget to finish the wine…. This entry was posted in Entertaining, Living and tagged Entertaining, Living, recipes, seafood, summer. Bookmark the permalink.